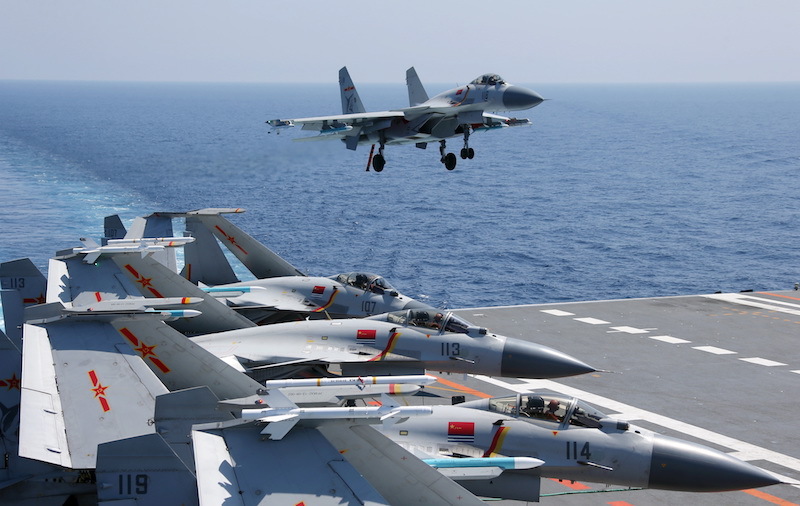 China’s J-15 naval fighter is too heavy to fly high and far from Liaoning, the Chinese navy’s aircraft carrier, and there aren't enough of them to equip both carriers when the second, now on sea trials, enter service. China’s one commissioned aircraft carrier and its second one doing seat trials at the moment face one serious problem – finding enough combat aircraft to take off from them. China’s aircraft carrier-borne J-15 is a fourth generation, twin-jet, all-weather fighter developed by the Aviation Industry Corp of China. It took to the skies from the Liaoning’s ski-jump-like bow for the first time in 2012. Yet it appears that since then, the J-15’s production and deployment have been hovering around low levels: the People’s Liberation Army only had about 40 of these fighters in active service as of last year, according to the PLA Daily. To put that number in perspective, the Liaoning needs 24 J-15s to form a combat-ready fighter squadron and her sister ship, the Type 001A carrier now getting ready to be commissioned, will also need the same amount of J-15s when it eventually sets sail as a combat-ready member of the fleet.